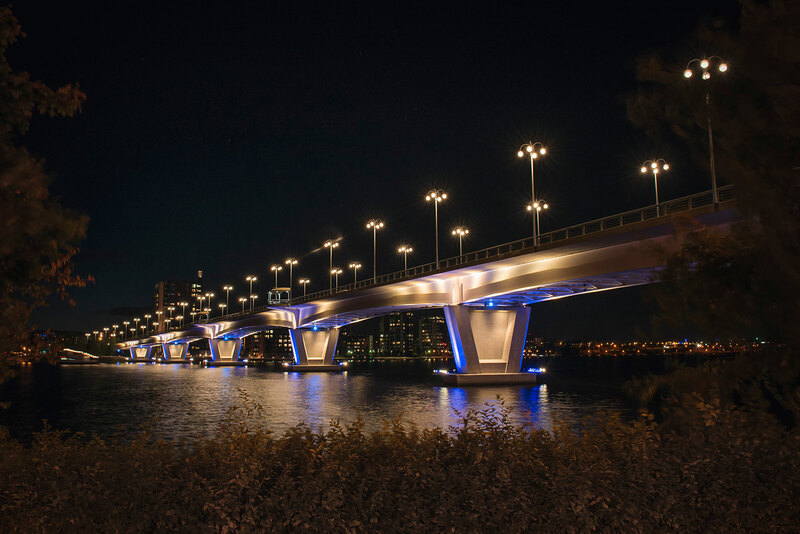 Lighting of Kuokkala Bridge enters age of LED technology. Energy efficiency improved by 74% as old high-power sodium luminaires were replaced by Valopaa LED luminaires. The old poles and the design of the luminaires were preserved. Kuokkala Bridge is one of the best-known landmarks of Jyväskylä. 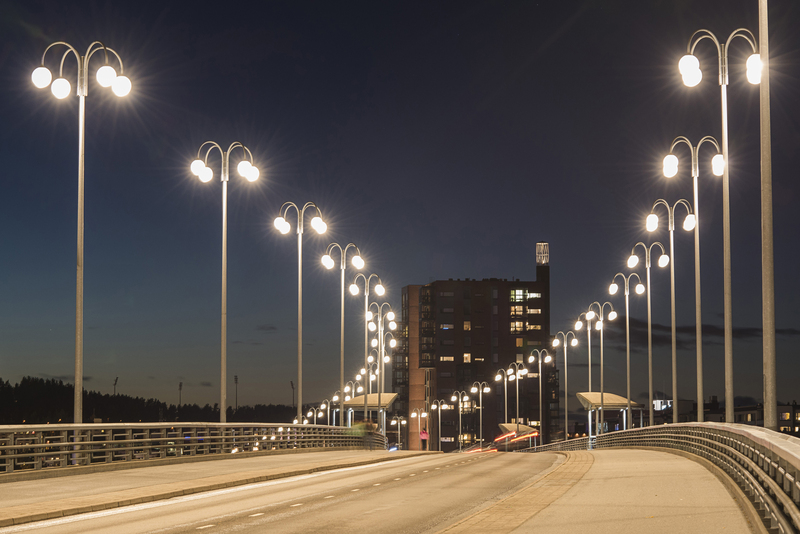 Valopaa LED luminaires replaced old high-power sodium lamps in the summer of 2013. The energy consumption of the bridge, which was completed in 1989, dropped to 25%, and simultaneously the quality of the light improved. Instead of the old yellow light, the bridge is now illuminated by pure and white light. The fifty light poles of the bridge received four new bollards each – a grand total of 200 luminaires. The look of the luminaires remained the same. The project was swift and smooth. Planning began early 2013 and the installation took place during the summer. 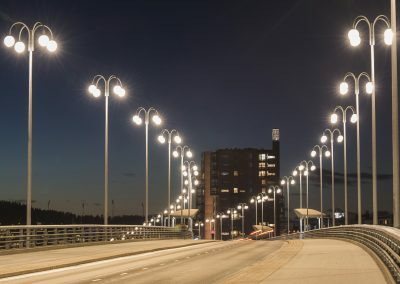 Renewing the lighting is a part of the City of Light – project, which Jyväskylä has pursued for nearly ten years. Project co-ordinator Annukka Larsen is extremely pleased with the bridge lighting renewal process. “I think this borderlines a perfect project. The aim was to renew the lighting to save energy without changing the appearance of the bridge – be it day or night. We succeeded well in both of those aims´, she states. The total power of the Kuokkala Bridge was previously 23400 W, now we are down to 6000 W. This annually saves 63000 KwH, equivalent to the energy consumption of three Finnish houses. Furthermore, additional savings are achieved because the maintenance and service needs of LED luminaires are minimal. The lifespan expectancy is 30 years. The total cost of the renewal was €130000. Jyväskylä received 25% state-subsidizing, leaving 97500 self-financing. The payback time is only 11 years, with all factors taken into account. Kari Ström, of the city of Jyväskylä, says that several options were considered for the renewal of the bridge lighting. The decision to choose LEDs had a number of reasons. “The prices of LEDs have come down significantly and LED technology has improved rapidly. Our objectives to save energy are achieved nicely and the provided amount of light is good´, he summarises. 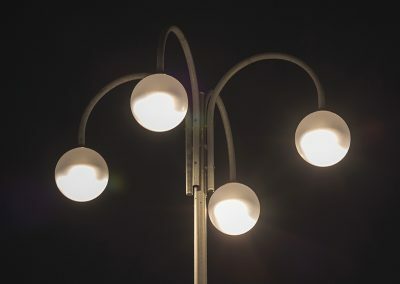 This is not the first pleasant experience of LED luminaires for Jyväskylä, the City of Light – a project of Jyväskylä has deployed LED lighting in numerous targets. The underpasses of Jyväskylä are, e.g., equipped with Valopaa LED bridge luminaires.